Every now and then one encounters a movie where the story of its creation is as or more interesting than the story the film wants to tell. Rocky almost didn’t get made because Stallone insisted that he be allowed to star in it. Children of Paradise was made in Nazi-occupied Paris with a significantly Jewish crew. And Preston Sturges sold the script of The Great McGinty to Paramount for $10 with the condition that he be allowed to direct. Considering that this won the 1940 Oscar for Best Original Screenplay, I’d say that Paramount got its money’s worth. We start in a bar in some unnamed third-world country where a man named Tommy (Louis Jean Heydt) is lamenting the fact that a single moment of weakness in an ethical life has led him to this bar to avoid jail and extradition. His career as a bank employee was ruined by a sudden moment of embezzlement. While he is comforted by the bar’s dancing girl (Steffi Duna), he is told a story by the bartender. 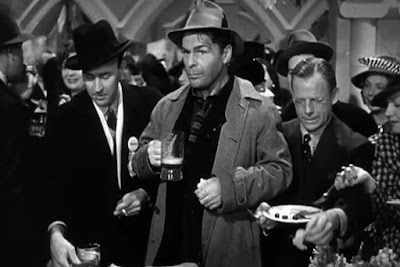 That bartender claims to be Daniel McGinty (Brian Donlevy), a former bum turned mayor of a major city, then governor, then criminal, then escaped convict. In his case, he’s ended up tending bar in the dive because of a single moment of honesty in a life of corruption. The bulk of the film will be McGinty’s flashback. His career begins when he drifts into town during an election. Offered $2 to vote under an assumed name in the rigged mayoral election, McGinty decides to get clever. He moves from precinct to precinct and votes 37 times, earning himself a tidy $74, which works out to almost $1300 in today’s money. Unwilling to pay, political underboss Skeeters (William Demarest) brings him to meet the man in charge. McGinty so impresses the local boss (Akim Tamiroff) that he’s soon earning his pay as an enforcer collecting protection money for the boss. As it turns out, in addition to running a bunch of rackets, the boss is more or less in control of all of the politics in the city. He runs both parties, figuring that it makes more sense for him to simply always be in power. With a change needed at the top, McGinty is run as a reform candidate. However, since women evidently won’t vote for a bachelor, a wife is needed. McGinty’s devoted secretary Catherine (Muriel Angelus, in her final role before her very early retirement) agrees to the marriage of convenience. It turns out she was married previously and has two children, providing McGinty with an instant family, at least on paper. For McGinty, the path to political success is simple. He does more or less what he wants and what he thinks needs doing, but he makes the profit from it. His rationalization is that the public still benefits, and since someone is going to profit, it may as well be him. Things go swimmingly, except that he starts to fall for Catherine, who has always had a bit of a soft spot for him. However, since the marriage was a sham to begin with, Catherine is still seeing her old flame George (Allyn Joslyn) on the side. The confrontation is what makes the McGintys a real couple, and suddenly Daniel McGinty is on the straight and narrow due to the influence of Catherine and to serve as a good role model for her children. But the real trouble doesn’t start until he’s elected governor. I’m going to stop there, because McGinty’s time as governor is more or less what comprises the third act of the film. It’s worth noting that The Great McGinty will always have a special place in my heart for a very specific reason. I have an unusual (to say the least) surname. The Great McGinty is only the third time in my life I’ve encountered a character who has it. * When McGinty runs for governor, his opponent is Senator Honeywell. The Great McGinty is pure Preston Sturges. While this wasn’t his first screenplay by any stretch, it’s perhaps the first of his truly good ones (at least that he got sole credit for writing). Most of his trademarks are here. The Great McGinty is mocking and cynical like the rest of his better films. It has the some sort of nose-thumbing attitude of Hail the Conquering Hero or The Miracle of Morgan’s Creek with the same sort of character mix of The Lady Eve. It’s hard not to enjoy, even if every character, especially McGinty and the boss, are caricatures. The biggest selling point of The Great McGinty is that it’s clever. It’s a movie that wants to make its point without being taken too seriously while it does. That was always the strength of Preston Sturges’s pen. He could be fun and funny and enjoy creating unbelievable characters while having a larger point that really sticks. It’s a nice testament to his skill that he makes this work with actor who were smaller players in more expensive films—while their performances are good, it’s the screenplay that really sells this. * The first “Honeywell” was basically a CIA operative in an episode of The Monkees. The second was Kim Cattrall’s oversexed character in Porky’s. Also, kudos if you get the reference for the title of this review. Why to watch The Great McGinty: Someone needs to laugh at politics. Why not to watch: Dirty politics hits a little close to home right now. Just the thought of Akim Tamiroff in this movie makes me smile! P.S. My dad once worked for Honeywell in Minneapolis/St. Paul. I'm distantly (very, very distantly) related to the people who started the corporation. I'm something like a ninth or tenth cousin. I do, whenever I go anywhere new, seek out the thermostat. If it's a Honeywell, I typically say to myself, "Quality products..."